Ultra-compact and lightweight with power assist – holes up to 1-1/8″ dia. 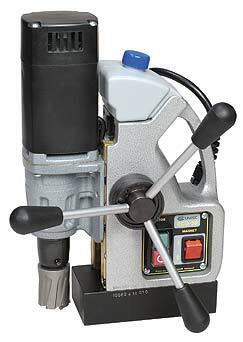 Model CSU 30AC includes patented power assist mechanism to reduce load on motor and cutter. Standard equipment includes auto lubrication, carrying case, chip guard, safety chain, carabin hook, gloves, safety glasses, ear protection and allen keys. • Lightweight at 22 lbs. • Powerful high-density dual-coil magnet has superior holding strength of 3300 lbs. Magnetic Force (1″ Plate): 3300 lbs.